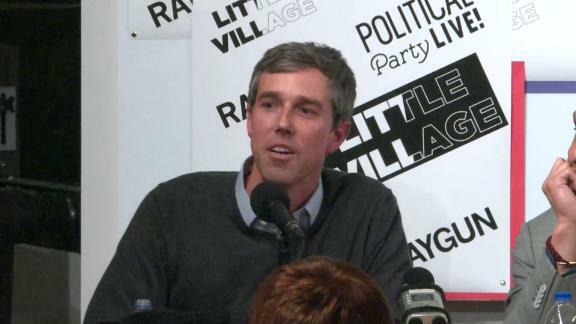 Democratic presidential candidate Beto O'Rourke apologized for joking at several campaign events that his wife has been raising their children "sometimes with my help." On Friday, Democratic presidential candidate Beto O'Rourke apologized for joking on several occasions that his wife, Amy, raised his three children, "sometimes with my help." Critics were quick to point out the unfair burdens placed on mothers, and argued that a female presidential candidate with young children would be condemned for making a similar remark. In his apology, O'Rourke said, "Not only will I not say that again, but I'll be more thoughtful going forward in the way that I talk about our marriage. ... My ham-handed attempt to try to highlight the fact that Amy has the lion's share of the burden in our family -- that she actually works but is the primary parent in our family, especially when I served in Congress, especially when I was on the campaign trail -- should have also been a moment for me to acknowledge that that is far too often the case, not just in politics, but just in life in general. I hope as I have been in some instances part of the problem, I can also be part of the solution." O'Rourke also acknowledged that he had "enjoyed white privilege." While it's great that he offered a sincere apology, voters would be justified in their anger at the former congressman's remark. It's unfortunate he thought it was OK to use the line repeatedly -- and that he hasn't managed to set a better example as an active dad despite the fact that he, like many other Americans, has a demanding career. By characterizing his parental role as an occasional helper to his wife rather than as an equal partner, O'Rourke reinforced the still-widespread idea that moms should shoulder the primary responsibility for raising kids. This persistent sexist stereotype is one of the key things holding women back in the workforce. I just experienced this social expectation firsthand: When I was pregnant with my daughter, I was often asked by family members, friends, colleagues and total strangers how I would balance work and family once my baby was born. My husband was almost never asked the same question. These beliefs are, of course, at least partly responsible for the unequal duties American moms shoulder. In 2016, moms spent 14 hours per week on child care -- nearly double the eight hours per week devoted by dads, according to the Pew Research Center. The disparity helps explain why the earnings of women suffer after they have children. Last year, a study by the Washington Center for Equitable Growth found that women with one child earn 14% less than childless women, while those with two children earn 12% less and those with three children earn 17% less -- a phenomenon that has been dubbed the "mommy penalty." Men, meanwhile, typically earn more money after becoming fathers -- often because they work more hours. But if women and men divided child-rearing responsibilities more equitably, this gap could shrink. A fairer division of labor would also give women other career advantages. If women and men were equally responsible for child care and paid parental leave was available to all, companies would have less incentives to hire and promote men over women. Even though such discrimination is illegal, it appears to happen in practice. For example, researchers found that if a woman indicates she belongs to a parent-teacher organization, she's less likely to get a response from potential employers compared with a candidate with an otherwise identical resume. For men, however, being a parent isn't a penalty -- and in many cases, it often helps their careers. More equitable partnerships, along with structural changes that would mitigate the "mommy penalty," could help more women accelerate in their careers and attain management positions. While women make up 46.9% of the American labor force, in 2017 just 39.8% of managers were female, according to the nonprofit Catalyst. Dads who step up to the plate would also be doing so to the benefit of their kids. Unsurprisingly, studies show that more involved dads or father figures are associated with a child's emotional well-being, behavior and academic achievement. Of course, the next president of the United States will have the power to propose and enact policies such as paid parental leave that could help American parents shoulder child care responsibilities more equitably. So it's essential that candidates strongly believe in the importance of helping both moms and dads balance their careers with raising a family. As a mom, I don't believe my husband is helping me when he cares for our daughter. I believe he's doing his duty as a dad. And I don't want anyone in the White House who doesn't agree with me.